WASHINGTON DC, WASHINGTON, UNITED STATES, July 12, 2018 /EINPresswire.com/ -- Technology is embryonic at rapid speed and the digital marketing landscape is ever sprouting. According to the research, there are over 4 billion internet users and about 3.3 billion are social media users worldwide. These stats give us a glimpse of how big our target audience is. The digital marketing expends will rise to about $332 billion by 2021. That's the reason; all the entrepreneurs and individuals are adopting digital marketing services for their businesses. To be a lending hand for the service seekers to ease the task of finding the best online marketing agencies, GoodFirms unveiled the Top Digital Marketing Companies worldwide that are providing custom strategies for their clients to boost their businesses on digital channels. The usage of digital marketing is increasing in an excellent way to influence your target audience into paying customers. Today, most of the businesses are also taking the help of Top Social Media Agencies as it assists in improving the business, building the credibility and trust. 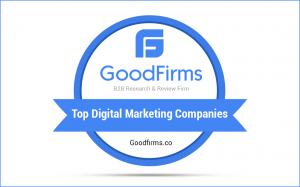 GoodFirms – a globally recognized B2B research and reviews platform acts as a connecting bridge allowing the service buyers to reach out the Top Digital Marketing Companies in Canada and the other best IT and software firms from all corners of the globe. The analyst team of GoodFirms runs a research process in which each agency is thoroughly measured using several qualitative and quantitative key factors including the on-hand experience in the same domain, market penetration, marketing strategy, branding, and promotion as well as feedback from their clients. Moreover, GoodFirms also supports the all IT and Software companies to be visible to the service seekers by asking them to participate in the research process with a proof of their excellent work provided by them to their clients. GoodFirms is a Washington, D.C. based research firm that aligns its efforts in identifying the most prominent and efficient digital marketing companies that deliver results to their clients. GoodFirms research is a confluence of new age consumer reference processes and conventional industry-wide review & rankings that help service seekers leap further and multiply their industry-wide value and credibility.